The #Samsung #Galaxy #Note5 is one of the best high end Android device out in the market today. Sporting a large 5.7 inch display and powerful hardware components, this phone is the best choice for consumers who regularly do various multimedia work while on the go. It’s use of a 3000mAh battery allows this device to be used for a longer period of time before a recharge is needed. There are however instances when power related issues can occur in this device. This is what we will tackle today as we address the Galaxy Note 5 reboots randomly issue & other related problems. Problem: My phone reboots randomly and very frequently goes into sleep mode and looks like it is turned off. In this situation only blue light blinks but it does not receive any call like it is powered off. People often complain that they called but my phone was off. Sometimes even blue light does not blink and it turns off automatically. Solution: What you can do right now is to check if the problem is caused by a glitch in the phone software. Sometimes a corrupt temporary data, a third party app, or some conflicts in the phone software can cause this issue. Listed below are the recommended troubleshooting steps that you need to do for this kind of problem. Check if the issue gets resolved after performing each step then move to the next should the problem still occur. Start the phone in recovery mode then wipe its cache partition. This deletes the temporary data in the phone which could be corrupt and is causing the problem. Start the phone in Safe Mode. In this mode only the pre-installed apps are allowed to run while apps you downloaded are prevented from running. If the problem does not occur while the phone is operating in this mode then it could be caused by an app you downloaded. Find out what app this is and uninstall it. Backup your phone data then do a factory reset. After the reset do not install anything in your phone yet. Try to check first if the issue still occurs. If the above steps fail to fix the issue then you should have your phone checked at a service center. Solution: The phone battery might be completely drained. Try cleaning the charging port of your phone using a can of compressed air or by blowing to it using a straw. Your aim is to take out any dirt or debris that could prevent the phone from charging. Next, you will need to do a soft reset by simultaneously pressing and holding down the power button and volume down button for at least 12 seconds. Once this is done charge the phone using a different charging cord and charger for 20 minutes. Check if the phone will turn on. If the phone does not turn on then I suggest you have this checked at a service center as this could already be a hardware related problem. Problem: My Samsung Galaxy Note 5 will not charge and will not turn on. I am traveling tomorrow across the country and have no phone. It has been charging, but wont turn on at all. It occasionally shows a battery with a Superman lightning bolt in it. Not impressed with this expensive phone. Any ideas? Tried different charger to our other identical phone and nothing. Tried it in the wall and usb, nothing. Ready to throw it away and get a cheap phone that will work. Solution: This issue is similar to the one that we have addressed above. What you need to do is to clean the charging port of your phone as it might have some dirt or debris which could be preventing the device from charging. Once the port is clean charge the phone using a different charging cord and wall charger. You should also try charging the phone on a different electrical outlet. If the issue still remains then the charging port of your phone might be damaged or it could be caused by a faulty charging circuit. Another possibility is that the battery is acting up. I suggest you have your phone checked at a service center if this is the case. Problem: hi. i recently had a problem with my note 5. just this morning, when i charged it, it gets a power sharing message. and the charging is very intermittent. i wasn’t able to charge it the whole day. Then when i tried charging it again (original fast charger), i can’t charge it via the usb cable anymore. can’t even connect it to my laptop. Can you help me fix this please? i also had some occurrences of a samsung vr app just popping out. what happened? i think the charging port was disabled or broken after that incident. please help. i tried wireless charging. it’s working. but i need the charging/utility port working for file transfers. PLEASE HELP. Solution: If the phone does not charge using a wired charger and you can’t transfer files using a USB cord between your phone and the computer then it’s possible that the problem is caused by the charging port. The only troubleshooting step you can do for this port is to clean it. Use a can of compressed air or blow into it using a straw. The aim is to take out any dirt or debris that could be present in this port and is causing the issue. You should also check if using a different charging cord fixes the problem. If the above steps fail then you should have your phone checked at a service center. Problem: SAMSUNG NOTE 5 FROZE WHILE I WAS ON IT USING INTERNET. SHORTLY AFTER THAT IT WOULD NOT POWER ON AND CHARGE. 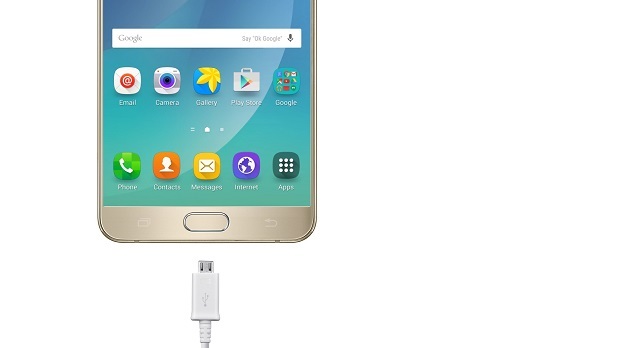 WHEN PLUG TO A CHARGER, THE SCREEN DISPLAYS “samsung GALAXY NOTE 5” in the middle of screen and bottom of screen would say, “powered by ANDROID”. What could possibly wrong please. Solution: If your phone is stuck in the boot logo then there’s a possibility that the problem is caused by a glitch in the phone software. The first thing that you need to do is to force your phone to reboot by simultaneously pressing the power and volume down button for around 12 seconds. The phone should restart. If the issue remains then try starting your phone in Safe Mode. If your phone starts in this mode then the issue could be caused by a third party app. You need to find out what app this is and uninstall it. Finding this app requires a trial and error method. Should the issue still occur then you need to start the phone in recovery mode. From here I suggest you do a factory reset. Take note that the reset will erase all data in your phone so make sure to have a backup before proceeding. Problem: My phone has recently been acting strangely. I’d be doing random activities on my phone and then hit the power button, and then sometimes I’d come back and try and use the phone, and the phone would restart by itself. Today my phone cut off and the hasn’t been turning on or charging at all. I tried troubleshooting with the volume key and power button but it didn’t work. Can you guys help me? Solution: The first thing that you should do in this case is to make sure that the battery is charged. To do this you need to clean the charging port of your phone by using a can of compressed air or by blowing to it using a straw. Next, charge your phone for at least 20 minutes using a different charging cord and wall charger. Turn on your phone. If the phone does not turn on then try to check if it starts in recovery mode. If it does I recommend that you do a factory reset. Take note that this will delete your phone data. If the above steps fail to fix the problem then you should have your phone checked at a service center as the issue might be caused by a faulty battery.